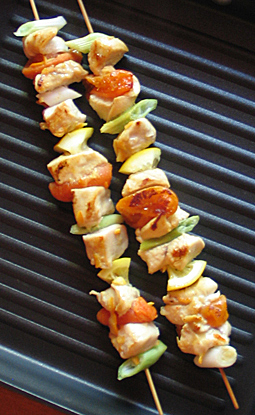 Citrus Chicken Skewers - A recipe from Savor California, the online showcase for extraordinary gourmet foods and beverages from California. If using bamboo skewers, prepare them by soaking in water until you're ready to thread them. Spray grill rack or stovetop grill pan with non-stick spray, then heat to medium-high. In a small saucepan, melt the marmalade over medium heat for about 1 minute. Whisk in the vinegar, soy sauce, orange juice, ginger, chili garlic sauce and mustard. Set aside. Rinse the lemons and cut into 1/2" chunks (don't remove the rind; it helps to keep the lemon slices on the skewers); discard the ends and any seeds. Pat the chicken dry and season each side with salt, pepper and chili powder. Cut into 1" cubes. Thread onto the skewers the chicken, onion, chunks of lemon, and apricots folded in half. Repeat the process until skewers are equally filled. Pour off 3 tablespoons of the marmalade mixture to use for basting and keep the remaining mixture warm. Brush marinade on all sides of the skewers and grill until chicken is cooked, about 5 minutes per side. To serve, unthread skewers onto 4 dinner plates and drizzle with warm sauce.